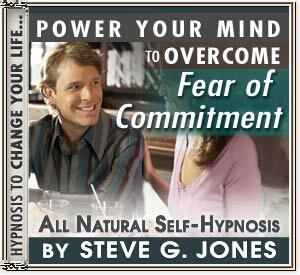 LEARN HOW TO COMBAT COMMITMENT PHOBIA WITH HYPNOSIS!!! This NEW powerful self hypnosis CD and MP3 will give you the confidence you need to overcome your fear of commitment and take charge of YOUR LIFE!!!!!. The fear of commitment can escalate with the accumulation of unfortunate relationship experiences. Certainly it is typical for a male who has been married before and has found himself in a costly divorce to be gun shy when it comes to the possibility of a marriage or even lesser relationship commitment in the future. This can also be true of women who have had similar unfortunate relationship experiences. This recording is designed to remind you of the many wonderful relationships which exist in the world and also to remind you that you are fully capable of having one of those types of relationships with your loved one or potential future partner. I have another recording called “Remain Faithful” which deals with this problem in depth if cheating seems to be a problem. However, this recording touches on it somewhat as well since it is related to commitment. I primarily focus on getting you over your fear of commitment in this recording so that you can either have a stable dating relationship and/or marriage.